Get Focused at Work with 3 Simple Strategies | Knapsack Creative Co.
How many times are you interrupted in an average day at work? How long does it take you to get back on task? How much of your time and productivity do you lose to these interruptions? According to this Washington Post article (and the University of California study it was based on), "the typical office worker is interrupted or switches tasks, on average, every three minutes and five seconds. And it can take 23 minutes and 15 seconds just to get back to where they left off." The article goes on to say that in some industries workers can lose up to 6.2 hours every day, or 31 hours a week due to interruptions and distractions. That's just insane! In this post I'll share some ways that I stay focused at work and make the most of the time that I have. These methods help keep me from getting distracted and get more done. Since our team often works in one open room without cubicles, it's easy for me to get distracted by background office chit-chat or conversations the team is having with a client. Putting on my noise-canceling headphones removes that distraction entirely. Ah, complete silence. Playing energetic or relaxing music (depending on what I need at the time) helps put me in the right mood to get work done. Also, listening to ambient nature sounds or white noise can be very therapeutic and puts me in the right headspace. An added bonus of the big honking over-hear headphones is that my team knows that when I have them on, Ben is focusing. When I'm focusing they'll postpone any non-urgent questions until I'm done with the current task and take a stretch break. A quick anecdote about these: I gave a pair to one of my good friends, knowing that he works in a very distracting open-office environment. I hoped they would help, and they did. He now uses them every day and says it's vastly improved his experience at work. This simple but powerful timeboxing method has been a game-changer for my productivity. Here's the basic idea: Work on one task with 100% focus for 25 minutes. Then take a 5 minute break. Repeat. It works best when I set a specific goal for the 25 minutes. For example, if I'm designing a website I might set a goal to finish a draft of one page in 25 minutes. As soon as the timer goes off, I stop working immediately and set another timer for 5 minutes. Even if I'm in the middle of something I force myself to leave what I was working on and walk around the office. This gives me a chance to rest my eyes, stretch, and reconsider my priorities. Should I continue on the same project or move on to something else? By the way, stopping a task immediately even if it's left undone has the side-benefit of creating a good point to resume the task after the break. Starting the next work block by finishing something partially completed helps get the momentum going more easily. There's just nothing like that crazy adrenaline rush of finishing a design before the time runs out. Or maybe that's just me. Yeah, I think that's just me. Focus To-Do iOS app - I love this app because there's a ticking timer sound that plays while the timer is counting down. It reminds me that I have a timer going and keeps me from getting distracted. Pomodoro sand timers - I like these because they remind me of the importance of time every time I see them on my desk. But really I mostly like them because they look cool. Link to Amazon listing in the resources below. 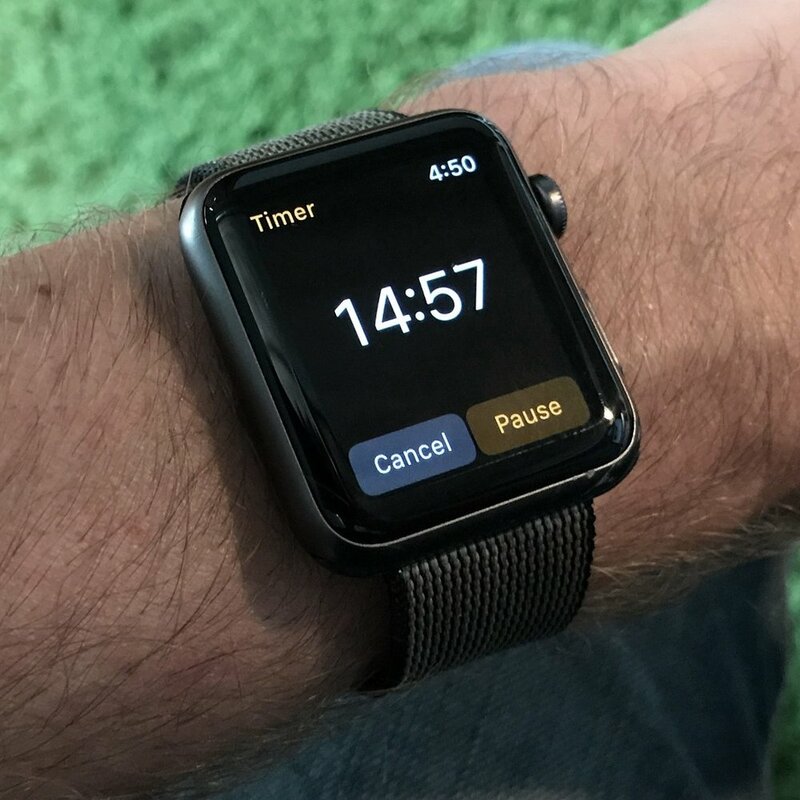 Wristwatch - You can pretty much use any watch that can count down to an audible timer. I like the Apple Watch because its easily voice controlled and can vibrate instead of make sound when the timer ends. Often my most productive days are achieved using the pomodoro technique. I love starting out my morning with a few solid hours of pomodoro blocks. After that I've usually accomplished enough to feel good about my day, and any work completed after that is just a bonus. The thing is, that's their job: to get stuff done. And sometimes to get stuff done they need a decision from me to make it happen. It's not their fault that I'm getting interrupted from other important work I'm doing. In fact, it's my responsibility to set my priorities and limitations on how much time they can take up and when. If I don't set boundaries then I won't be able to meet their needs efficiently or effectively (or if I do, I'll be overworking or stressing myself out in the process). Before I started Knapsack I worked at several other office jobs where interruptions were a normal part of the culture and were almost expected and accepted as a necessary evil. I'll admit I was afraid to do it at first, but I eventually got up the courage to talk with my boss (and colleagues) and tell them I needed some daily focus time so that I could be productive. To my relief, they were very open to the idea, with a few caveats, and were willing to try it out. I made sure that I had times when I was available specifically for communicating with others. Once other people on my team saw the increased productivity (and that other people were willing to respect their time) they started doing it as well, and with great results. You may have noticed on our website that the Knapsack office is open Monday-Thursday, closed on Fridays. Let me let you in on a little secret – that's not entirely true. In fact, we're doing our most important work on the Fridays that we're "closed". We review our week together, tweak our processes, learn new skills, come up with solutions to problems and make the experience for our clients even better. We couldn't do this without setting some boundaries and expectations with our clients. In the end, these guidelines help us help our clients. These are the timers that I have on my desk. I really love the minimal design and they're a good deal for only $25. This iOS app has a lot of great features including tracking what types of work or tasks you are doing during your pomodoro sessions. I designed these desktop and phone wallpapers to help remind you (and me) to stay focused throughout the day at work.